There are two powerful strands to Kiefer’s work since the early 1980s; a philosophical investigation into the problems of representing transcendence and experimentation with materials and images to create hybrid forms between paintings and sculpture that confound traditional representations of space. Kiefer describes both these enquiries as journeys into the unknown. The idea of the journey is a metaphor that he often includes in images and in material processes. In ‘Glaube Hoffnung Liebe’ the journey is potentially a flight that would take us from the material plane into the heavens and yet the propeller is made of lead and will never fly. The words in the title are inscribed on the three blades, they are St Paul’s three cardinal virtues; faith, hope and love. Perhaps Kiefer is implying that neither technology nor the exercise of virtue can achieve literal transcendence and yet he is constantly asking the question, why not? Applying an object such as this lead propeller to a representation of a landscape contradicts the logic of spatial representation. Where in the space of the painting do we locate the object? Is it lying on the rock shelf or hurtling through space? In fact it is not in the space of the painting at all but hovers as if in a separate dimension or representational register. Yet the two kinds of space are magically integrated so that we don’t see one or the other but both at once something akin to the strange behaviour of quantum physics. 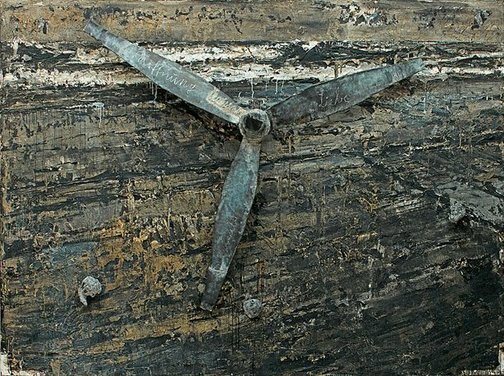 Anthony Bond, Anselm Kiefer: aperiatur terra , 'Fields of reference', pg.50-57, London, 2007, 52 (colour illus. ), 53. Anthony Bond and Victoria Lynn, AGNSW Collections , 'Contemporary Practice - Here, There, Everywhere ...', pg. 229-285, Sydney, 1994, 257 (colour illus.). Anthony Bond, Art Gallery of New South Wales handbook , 'Contemporary', pg. 94-108, Sydney, 1988, 97, 98-99 (colour illus.). Donna Brett, Contemporary: Art Gallery of New South Wales Contemporary Collection , 'Expression and the figure', pg.108-153, Sydney, 2006, 112, 136, 137 (colour illus. ), 430, 436. Bruce James, Art Gallery of New South Wales handbook , 'Western Collection: Paintings and Sculpture', pg. 17-77, Sydney, 1999, 75 (colour illus.). Margaret Plant, Art and Australia (Vol. 26, No. 2) , 'Sydney Biennales', pg. 254-263, Sydney, Summer 1988, 262. Jill Sykes, Look , 'New on two', pg. 18-19, Sydney, Sep 2006, 18. Michael Wardell, Look , 'Mervyn Horton's bequest', pg. 11-12, Sydney, Jun 2004, 12. From caves to canvas: an introduction to western art , 'Painting Now: Transavantguardia and a new expressionism', pg.272-292, Sydney, 1992, 281 (illus.). From caves to canvas: an introduction to western art (Second edition) , 'Art of the '80s: Graffiti, New Expressionism, Post -'70s Architecture', pg.337-363, Sydney, 1998, 341 (colour illus.). Unknown and Unknown, Aeronáutica y Pintura , Spain, 2001, 222, 223 (colour illus. ).